Caroline Roper Warwick discusses using professional science communicators to help faculty share their stories at ACE 2018. 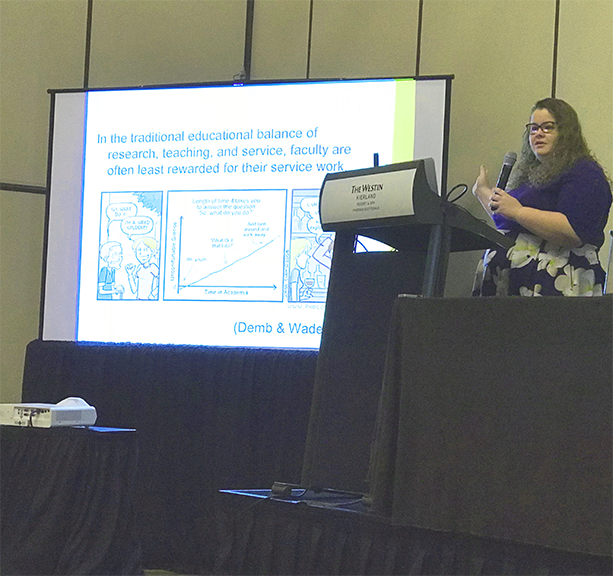 Earlier this month at the joint meeting of the Association for Communication Excellence in Agriculture and Natural Resources and the Agricultural Media Summit in Phoenix, Arizona I was selected to give a presentation on academic storytelling, faculty expectations for outreach and my role as a science communication specialist here at the UF/IFAS Mid-Florida Research and Education Center (MREC). The presentation, entitled “Science Communication: Academic Editing, Storytelling & Engagement,” detailed the shift in expectations by administrators for physical science faculty to conduct outreach, the challenge in convincing faculty to engage in outreach, MREC’s method of employing a science communication specialist to help publish and disseminate science and a brief overview of some of my successes and failures as I have begun to develop my role. During my presentation, I discussed the pressures on faculty to not only to publish their research but also to share their research with stakeholders, including industry members, students, other academics and the general public. To assist faculty members, MREC employed a science communication specialist to help faculty revise and publish manuscripts, seek out funding opportunities and disseminate findings through both traditional and online media outlets. MREC has seen success with hiring a science communication specialist, with an increase in the number of manuscripts published annually, EDIS documents, media coverage of the center, social media traffic and grants funded. Overall, discussing the need for science communication specialist with other colleges, administrators and faculty from around the country was an invaluable experience, and I hope to bring much of what I learned into action at MREC. One of the most valuable presentations at the conference was by University of Wyoming faculty member Andrew Kniss, who discussed “How to Write the Right Way,” emphasizing the importance of understanding statistics. Oh, and one more thing… “Don’t worry about the 108-degree temperatures – it’s a dry heat,” is most definitely a lie.